Depression is one of the most common psychiatric morbidity among the elderly., Depression is associated with significant morbidity and premature mortality. Presence of depression in medically ill patients influences the overall outcome of these disorders. Management of depression among elderly involves use of antidepressants, psychological treatments, and somatic treatments. Among people with moderate-to-severe depression, pharmacotherapy in the form of use of antidepressants is one of the most commonly used intervention. Two-third elderly patients with depression have presence of at least one comorbid physical illnesses. Most commonly seen physical comorbidities include presence of hypertension and diabetes mellitus. Higher prevalence of physical comorbidities, use of concomitant medications, and reduced physiological reserve require judicious selection of antidepressants. One of the dreaded and clinically challenging side effects of antidepressants among the elderly is hyponatremia. The incidence of hyponatremia is reported with almost all antidepressants, with an incidence rate of 0.6%–40%. The wide variation in the incidence rate is influenced by the study setting (community-based/registry based/clinic based), sample size, and the cut-off used for serum sodium level to define hyponatremia. In general, higher rates have been reported in clinic-based studies with smaller sample. Among the type of antidepressants, hyponatremia is reported with all antidepressants, with most commonly reported with various selective serotonin reuptake inhibitors (SSRIs). However, this can be possibly attributed to this class of drugs being the most commonly prescribed agent in recent times. Studies have reported certain risk factors for the development of hyponatremia with antidepressants. The commonly reported risk factors include old age, female gender, past history of hyponatremia, low body weight, low baseline sodium levels, summer season, initial phase of antidepressant use, early onset psychiatric illnesses, longer duration of psychiatric disorder, prolonged admission, concomitant use of drugs like diuretics, nonsteroidal anti-inflammatory agents (NSAIDs), chemotherapy, Angiotensin-converting enzyme inhibitors, cytochrome P450 inhibitors, reduced renal function, and presence of medical comorbidities such as hypothyroidism, hypertension, cardiac failure, and diabetes mellitus., However, reporting of these risk factors is not consistent across different studies. However, besides antidepressants, use of other psychotropics has also been linked to the development of hyponatremia. However, little is known about influence of these variables on the incidence of hyponatremia among elderly. There are many case reports of association of hyponatremia with use of antidepressants from India., However, there is lack of any systematic study evaluating this association. In this background, this retrospective study aimed to evaluate the clinical risk factors for the development of hyponatremia among elderly patients started on antidepressant medications. Additional aim was to evaluate the management of antidepressant-associated hyponatremia and its outcome. This was a retrospective study which was carried out in a tertiary care multispecialty hospital in North India. The study was approved by the Institute Ethics Committee. The inclusion criteria for the study were age of the patient to be ≥60 years at the time of prescription of antidepressant and for whom serum sodium levels were available just before starting of antidepressant medications. For this study, treatment records of elderly patients (age ≥60 years) were reviewed. Only those elderly patients who were started on antidepressants and for whom baseline serum sodium levels were available just before starting of antidepressant medications and who developed hyponatremia (serum sodium level <135 mEq/L) within few days of starting of antidepressant medications were considered to have hyponatremia. Patients were considered to have antidepressant-associated hyponatremia when the same was confirmed by at least 2 consecutive reports; there was no history of any associated loose motions or recent change in any medications for the concomitant physical illness. Data in terms of demographic profile and clinical profile were extracted. An age- and gender-matched comparison group of elderly patients was selected to evaluate the risk factors for the development of hyponatremia. 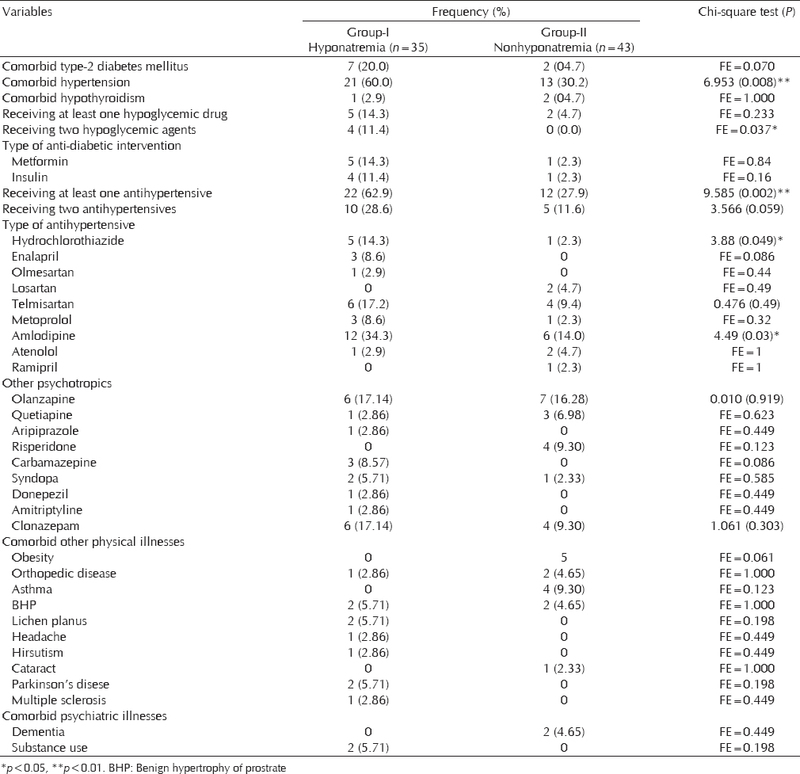 The clinical data included diagnosis, age of onset of illness, drugs taken by the patients (psychotropics and nonpsychotropics), and history of any medical comorbidity (diabetes mellitus, hypertension, stroke, heart failure, and dyslipidemia). Data in terms of medications were extracted in the form of type of antidepressants associated with the development of antidepressant and concomitant medications. SPSS 14 (SPSS for Windows, Version 14.0. SPSS Inc., Chicago) was used for analysis of the data. Continuous variables are expressed in the form of mean and standard deviation (SD). Categorical variables are expressed as a frequency and percentages. Comparisons were done using unpaired t-test and Chi-square test. Two-sided P < 0.05 was considered to be statistically significant. The study included 78 participants, out of whom 35 belonged to the group with hyponatremia. The mean age of the study sample was 66.85 (SD – 6.47) years with majority of the patients aged 60–64 years and this was followed by the age category of 65–69 years. The mean duration of education for the study sample was 8.36 (SD – 5.64) years. Males outnumbered females. Majority of the participants were married, were living in an extended/joint family set-up. There was nearly equal representation of patients from the urban and rural locality. The mean family income was rupees 22,846. 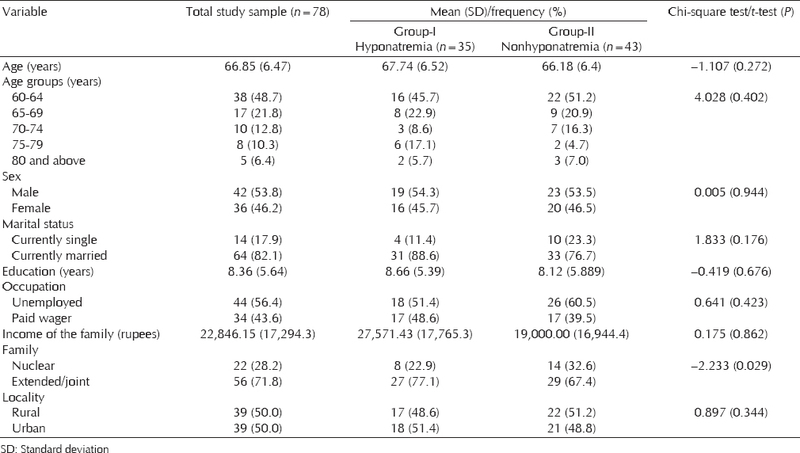 When those with and without hyponatremia were compared, there was no statistically significant difference between the two groups [Table 1]. The most common diagnosis in both the groups was recurrent depressive disorder and this was followed by the 1st episode of depression [Table 2]. Among those who developed hyponatremia, two patients had anxiety disorders and one patient among those without hyponatremia has dysthymia. In terms of severity of depression, more than half of the patients in both the groups had severe depression. The mean age of onset of illness for participants in both the groups was around 57 years. The mean baseline sodium levels of both the groups were comparable. As expected, patients in the hyponatremia group had significantly lower serum sodium levels at the time when the hyponatremia was detected. When the serum sodium levels of baseline and at the time of detection of hyponatremia were compared, there was significant reduction in serum sodium level (paired t-test 12.39; P < 0.001***). The mean reduction in serum sodium level was 10.51 mEq/L, with majority of the patients experiencing reduction in serum sodium level by 5–10 mEq/L [Table 2]. 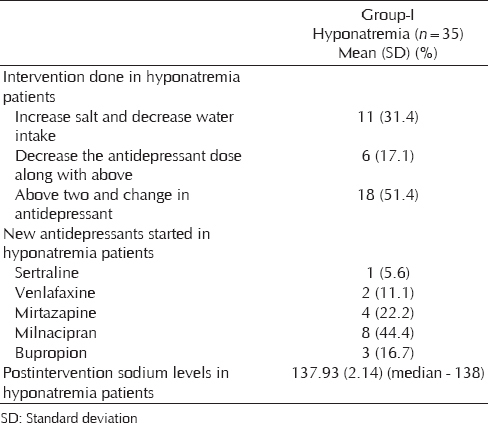 Majority of the patients who developed hyponatremia were receiving mirtazapine, followed by sertraline and venlafaxine [Table 3]. In terms of doses used, there was no significant difference in the doses used for escitalopram, sertraline, and venlafaxine between the two groups. However, compared to those without hyponatremia, those with hyponatremia received significantly higher dose of mirtazapine [Table 4]. Factors which were evaluated for development of hyponatremia included comorbid diabetes mellitus, hypertension, and treatment for the same. 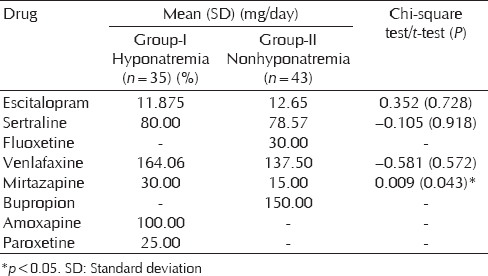 As is evident from [Table 5], higher proportion of those who developed hyponatremia had history of comorbid hypertension, were receiving antihypertensive agents, and were receiving 2 antihypoglycemic agents concomitantly. In terms of specific agents, concomitant use of hydrochlorothiazide and amlodipine were associated with the development of hyponatremia. None of the patients had cardiac failure, malignancy, diagnosed renal dysfunction, diagnosed hepatic dysfunction, stroke, and head injury. None of the patients had past history of hyponatremia and none were receiving NSAIDs. 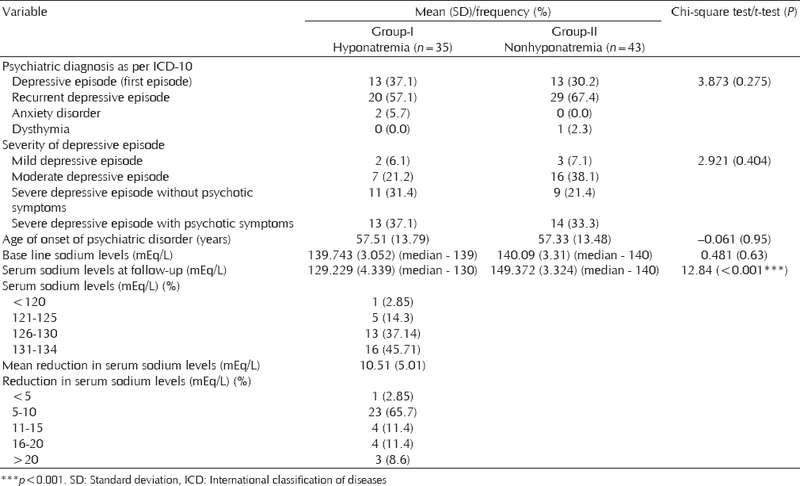 There was no association of hyponatremia with concomitant use of psychotropics, other physical illnesses (obesity, orthopedic disease, asthma, and Parkinson's disease), comorbid dementia, and comorbid substance use. 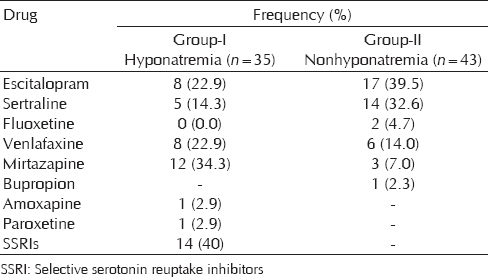 There was lack of significant difference in terms of frequency of use of various other psychotropics between those with and without hyponatremia [Table 5]. As shown in [Table 6], in about one-third of the patient, initial management involved increase in the salt intake and/or reduction in water intake. In another one-sixth of the patients, increase in the salt intake and/or reduction in water intake, was also accompanied by reduction in the doses of antidepressant being received. Overall, in half of the patients, hyponatremia could be managed with these strategies. However, in another half of the patients, hyponatremia did not improve with the above strategies and they required change in antidepressant. Among the antidepressants used, milnacipran was the most commonly used agent and this was followed by use of mirtazapine and bupropion. In occasional patients, sertraline and venlafaxine were used. While receiving these agents, there was no recurrence of hyponatremia in these patients. Hyponatremia can be a life-threatening side effect of antidepressants, especially in the elderly. Considering the lack of data from India, this study attempted to evaluate the limited number of risk factors associated with the development of hyponatremia. In this present study, both the study groups were matched for demographic variables. Both the groups were also matched for the severity of depression, type of disorders, and age of onset of illness. This was done to reduce to confounding effect of demographic and illness variables on hyponatremia. Hyponatremia was defined as present when there was reduction in serum sodium levels to <135 mEq/L as confirmed by two consecutive laboratory reports. This was done to include only those cases, which possibly had antidepressant-associated hyponatremia. Although the present study was not designed and powered to evaluate the incidence rate of antidepressant hyponatremia or the type of antidepressants most commonly associated with the development of hyponatremia, still the finding of the study suggests that SSRIs as a class of antidepressant medications are most commonly associated with the development of hyponatremia. This finding is also supported by the existing literature which has implicated these agents as the most offending agent. However, it is important to remember that SSRIs are the most commonly prescribed agents, sometimes amounting to more than two-third of the prescriptions. If one evaluates the incidence of hyponatremia by taking the prescription rates into consideration, it can be said that it would fallacious to conclude that SSRIs are the most common offending agent for the development of hyponatremia. In the present study, in terms of specific antidepressants, maximum number of patients who developed hyponatremia were receiving mirtazapine and this was followed by escitalopram and venlafaxine. This finding came as a surprise, as most of the previous studies have reported mirtazapine to be less often associated with the development of hyponatremia. However, association of hyponatremia with mirtazapine is supported by few case reports., Data from this center shows that among elderly and also adult patients too, SSRIs are the most commonly prescribed antidepressant class. Among the various antidepressants, escitalopram is the most commonly prescribed antidepressant and this is followed by use of sertraline. Similar, trends have also been reported in a recent multicentric study on depression for our center. Mirtazapine formed <10% of the prescription of antidepressants in these studies., Accordingly, the association of mirtazapine with the development of hyponatremia requires attention. Hence, there is a further need to evaluate the association of mirtazapine and hyponatremia. Although the existing data is not robust to suggest the association of antidepressant-associated hyponatremia with dose of antidepressant, in the present study, it is important to note that those who developed hyponatremia with mirtazapine were receiving the same in higher doses. In terms of risk factors, the present study suggests that antidepressant-associated hyponatremia is more commonly seen among those with comorbid hypertension, those concomitantly receiving two hypoglycemic agents, and those receiving any antihypertensive agent. Among the antihypertensive agents, the medications associated with hyponatremia included hydrochlorothiazide and amlodipine. Findings of the present study are supported by previous studies which have reported association of antidepressant-associated hyponatremia with the presence of hypertension and use of antihypertensives like diuretics. Accordingly, it can be said that clinicians managing elderly patients with depression should focus on the presence of physical comorbidity like hypertension and the medications used to manage the same. In such a clinical scenario, it would be advisable to avoid agents which are most commonly reported to be associated with hyponatremia and if used, then the baseline serum sodium levels must be recorded and the same must be closely monitored during the initial phase of treatment. The present study also suggests association of antidepressant-associated hyponatremia with use of amlodipine, which is a calcium channel blocker. This association has not been reported in the past. However, before drawing any conclusion, it is important to remember that this was one of the most commonly used antihypertensive agents in the present study sample and the resultant association could be spurious. However, in the present study, hyponatremia was not associated with the presence of hypothyroidism, diabetes mellitus, and baseline serum sodium levels. These findings are contrary to some of the earlier reports. These differences could be due to difference in the methodology. In terms of management, the present study suggests that, in about half of the patients, who develop antidepressant-associated hyponatremia, the same improves with measures like fluid restriction, increase in salt intake and reduction in the doses of offending antidepressants. There is evidence for the role of fluid restriction and increase salt intake in patients with hyponatremia., Previous studies do not suggest the association of hyponatremia with dose of antidepressants, and hence, dose reduction is generally not recommended. However, dose reduction is practiced, in situation, when hyponatremia is not noted with the previous dose but appears after increment of dose of antidepressant. Accordingly, findings of the present study must be considered as preliminary and this must only be considered in patients with mild hyponatremia and in whom further close monitoring is possible. Further these findings suggest that there is a need to evaluate the association of antidepressant-associated hyponatremia and doses of antidepressant used. In the present study, the most commonly used antidepressant in patients who developed hyponatremia was milnacipran, and this was followed by use of mirtazapine and bupropion. There are reports of previous successful use of milnacipran in patients with antidepressant-associated hyponatremia and possibly the selection of this antidepressant was guided by the same. Preferable selection of non-SSRI antidepressant was also possibly influenced by existing knowledge in this area. Exact mechanism of lower incidence of hyponatremia with milnacipran and lack of recurrence with this agent is not understood and future studies must attempt to evaluate the same. The present study has certain limitations in the form of retrospective study design, small sample size, and lack of coverage of all the risk factors reported in the literature. Future studies must attempt to overcome these limitations. The present study suggests that antidepressant-associated hyponatremia is more commonly seen in patients with comorbid hypertension and those receiving any antihypertensive agent. In addition, antidepressant-associated hyponatremia is seen in patients receiving more than one hypoglycemic agent. In terms of management, half of the patients can be managed without change of antidepressant, whereas another half of patients require change of antidepressant. Sathyanath MS, Kundapur R, Bhat US, Kiran NU. Proportion of depression among the elderly population in a rural health care setting. J Clin Diagn Res 2014;8:137-9. Valiengo Lda C, Stella F, Forlenza OV. Mood disorders in the elderly: Prevalence, functional impact, and management challenges. Neuropsychiatr Dis Treat 2016;12:2105-14. Frank C. Pharmacologic treatment of depression in the elderly. Can Fam Physician 2014;60:121-6. Sahoo S, Grover S. Hyponatremia and psychotropics. J Geriatr Ment Health 2016;3:108. De Picker L, Van Den Eede F, Dumont G, Moorkens G, Sabbe BG. Antidepressants and the risk of hyponatremia: A class-by-class review of literature. Psychosomatics 2014;55:536-47. Mannesse CK, Jansen PA, Van Marum RJ, Sival RC, Kok RM, Haffmans PM, et al. Characteristics, prevalence, risk factors, and underlying mechanism of hyponatremia in elderly patients treated with antidepressants: A cross-sectional study. Maturitas 2013;76:357-63. Avasthi A, Grover S, Aggarwal M. Research on antidepressants in India. Indian J Psychiatry 2010;52:S341-54. Grover S, Biswas P, Bhateja G, Kulhara P. Escitalopram-associated hyponatremia. Psychiatry Clin Neurosci 2007;61:132-3. Lockhart P, Guthrie B. Trends in primary care antidepressant prescribing 1995-2007: A longitudinal population database analysis. Br J Gen Pract 2011;61:e565-72. Cheah CY, Ladhams B, Fegan PG. Mirtazapine associated with profound hyponatremia: Two case reports. Am J Geriatr Pharmacother 2008;6:91-5. Ghosh A, Hegde A, Grover S. Mirtazapine-associated hyponatremia presenting as delirium. Indian J Pharmacol 2014;46:448-9. Lee JJ, Kilonzo K, Nistico A, Yeates K. Management of hyponatremia. CMAJ 2014;186:E281-6. Roxanas M, Hibbert E, Field M. Venlafaxine hyponatraemia: Incidence, mechanism and management. Aust N Z J Psychiatry 2007;41:411-8. Grover S, Somaiya M. Use of milnacipran in a patient with hyponatremia under the cover of fludrocortisones. J Clin Case Rep 2013;3:1000308.